Tick-borne diseases include all illnesses spread by ticks. The illnesses transmitted by black-legged ticks are discussed on the Co-infections page. Of all the tick-borne bacterial infections, Rocky Mountain spotted fever causes the most severe disease and has the highest mortality rate. Rocky Mountain spotted fever is transmitted by the American Dog tick, Brown Dog tick, and Rocky Mountain Wood tick. It is important to note that 5 non-Rocky Mountain states (North Carolina, Oklahoma, Arkansas, Tennessee, and Missouri) account for over 60% of RMSF cases. In adults, symptoms also include a severe headache and photophobia. A characteristic spotted rash may begin 5-6 days after fever onset on wrists, ankles, palms, and soles through the rash may be absent early in the disease and 10% of all patients never exhibit the rash. Treatment: doxycycline – should begin when the illness is first suspected. Long-term complications are possible if vasculitis occurred: expect end-organ damage, tissue necrosis, profound neurologic deficits, diminished renal function, amputations. Transmitted by Gulf Coast ticks, spotted fevers are caused by the bacterium Rickettsia parkeri. Though related to the agent that causes RMSF, this illness is less severe. Please be aware that cross-reacting antibodies may cause false positive results for RMSF. Caused by an RNA virus which is transmitted by the Rocky Mountain Wood tick. Caused by Coxiella burnetti, disease can be tick-borne, but most cases result from inhaling dust containing the bacterium. Lab testing: Diagnosis made based on IFA titers. 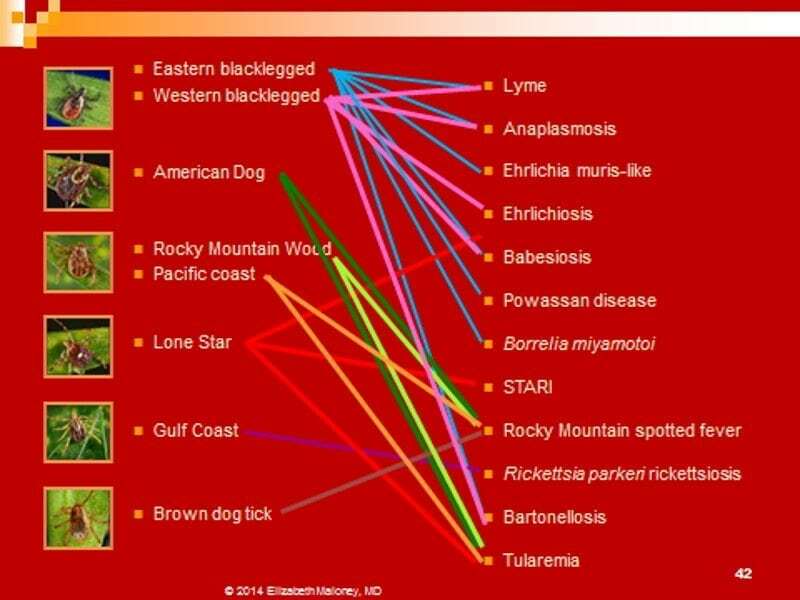 HME is a potentially serious infection caused by Ehrlichia chaffeensis, which may be transmitted by Lone Star and Western blacklegged ticks. HME has a 2-3% mortality rate. Most cases are located in SE and south-central states. Transmitted via a Lone Star tick bite; not known whether infectious agent is bacterial, viral or parasitic. Lab testing: No tests are currently available. There are multiple transmission routes which include contaminated water, skin contact with infected animals, inhalation or deer fly and tick bites. The tick-borne form can be transmitted by multiple vectors which include the Lone Star tick, American Dog tick, and Rocky Mountain Wood tick.